By Chris Williams: With the Manny Pacquiao vs. Juan Manuel Marquez fight now over with Pacquiao winning a controversial points decision last Saturday night, the excuses are already starting to pop up for why Pacquiao struggled so badly against the 38-year-old Marquez. You knew the excuses would come, but I didn’t expect them to happen so quickly from Pacquiao and his trainer Freddie Roach. One of the reasons Pacquiao looked so awful last night appeared to lose the fight by a comfortable margin was that he had foot cramps. Not sure what Pacquiao can do for his chronic cramps problem. Sure does sound like an excuse to me. I bet. I think Pacquiao is just getting old. I’m sure Marquez had his aches and pains but he’s not bringing them up because he’s not into making excuses. But then again, he has no reason to make any excuses. He fought beautifully against Pacquiao last night and deserved to win the fight. How sweet, Roach is making excuses for Pacquiao. Roach looked completely flummoxed at what to tell his fighter Pacquiao. You could see Roach spinning his mental gears but nothing he came up with seemed to help his fighter. 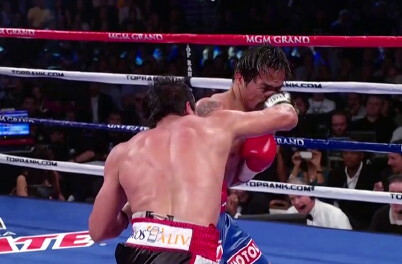 In the end, Roach was jabbering away without any positive action from Pacquiao. And I figured that Roach and Pacquiao would come up with excuses after the fight and sure enough here we are with the excuses. How sad. I do buy that Pacquiao had some cramps but I don’t think there’s much you can do about it. Pacquiao is 32 now, and that’s when you start seeing your body act up on you, especially with the small fighters like Pacquiao. He’s getting old now and cramps are one way for your body to tell you that you’re not a spring chicken anymore. Pacquiao no jumps around like he used to, and that’s been like that for the past year and half. It didn’t just happen this fight. pacquiao has really lost his foot work, and that’s why Marquez had such as any time with him last night compared to the last two times he fought Pacquiao.